Even with pre-assembled structures and prefabricated materials, it is crucial to keep installation sites safe. 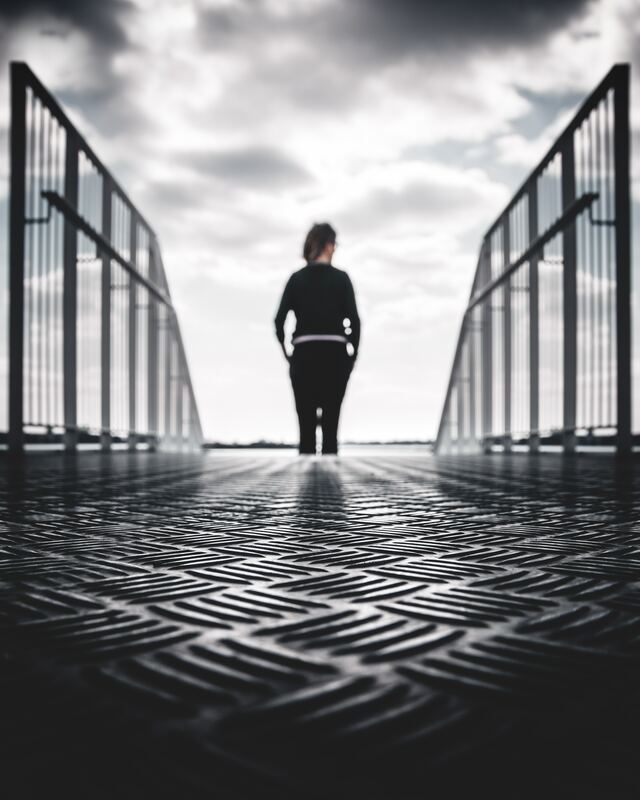 With most prefabricated projects, whether it be metal stairs or metal stair railings, the risk is minimal due to many traditional construction hazards being removed. Most prefabricated project sites have a smaller number of contractors, and not as many materials. This means less potential for accidents and installation error. Smaller staff and fewer deliveries to your project site leave the workers plenty of space they need to do their job efficiently. Prefabricated materials reduce the risk of construction accidents. They are pre-assembled and typically just require installation or minimal assembly on-site. In other words, the hard part is usually over by the time the material and the crew reaches the site. This reduces the potential for error and also the risk for your contractors. Clients are also happy as prefabricated materials speed up the overall process. Dealing with construction of any kind, there is always the risk of injury. Prefabricated construction, however, removes much of this risk for your contractors. Many factors that are considered to be hazards are removed with prefabricated metal products. That being said, safety should still be everybody’s number one priority. Many of the risks a contractor tackles at a job site can be easily avoided by taking proper precautions. The most common accidents on a job site are referred to as “The Fatal Four.” OSHA reported that in 2015, these accidents were actually responsible for 64.2% of construction worker deaths. These accidents include falls, being struck by an object, electrocution and getting caught between hazards. Taking precautionary measures will not only ensure a safe environment for your crew but it will assist them in doing more quality work overall. Safety around stairwells while installing metal stairs are crucial to your crew, as well as for your client. One important feature to remember is installing a metal stair railing around your staircase. Not only will this keep your steel stairs compliant, it will reduce the number of accidents and injuries that occur on-site. 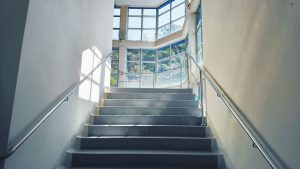 In addition to making sure your metal stair railing is installed correctly, it is important to keep environmental conditions from affecting your staircase. Especially with steel stairs, it is important to have a nosing on the end of your steps or consider a different color edge at the top and the bottom of the stairwell. This will help see the distance of each step as well as confirm that you’ve reached the last step. Also, consider photoluminescent steps for emergency stairwells and exits. Another factor that can help reduce accidents in your stairwell is increased lighting. Be sure the staircase is fully visible, especially during nighttime hours. If you have windows in your stairwell, be sure nothing obscures the view such as tree branches or bushes. This can block out the natural light during the day and make it much darker than it should be. Wood may be easier to install or work with, but metal railings hold up best. Elements like rain and insects can make even your sturdiest metal railing a potential hazard. Outdoor metal stair railings or composite railings will stand up to these environmental factors and are not prone to rotting. Stainless steel fasteners and high-quality powder coating will also prevent corrosion or rust in all types of weather. A second metal railing is sometimes a good idea as well. While most people are right-handed, a second railing in your staircase will provide an extra layer of safety for your prefabricated stairs. 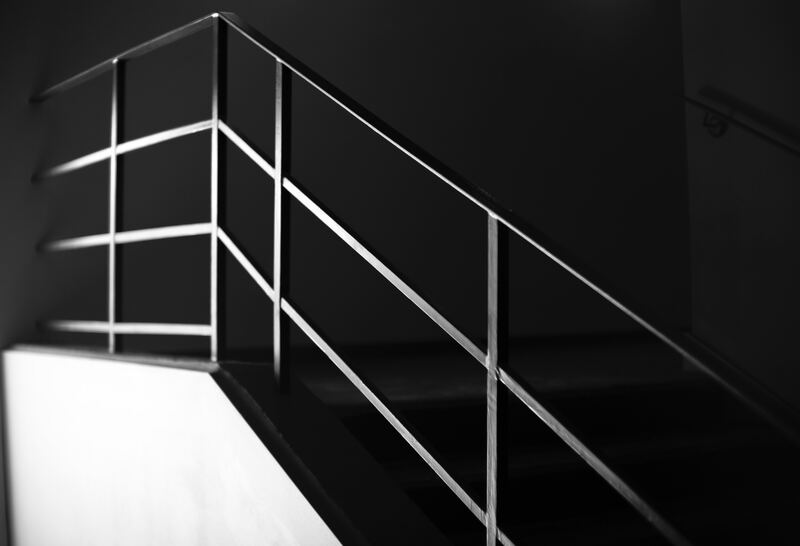 Having a second metal stair handrail ensures safety for people going up both sides of your metal stairs. There is no need to compromise safety if someone is using one side of the staircase or even if you are carrying something in the opposite hand. Metal stair handrails on both sides give you extra security, no matter the circumstance. If you are looking to install metal stairs at your home or business, consider a set of prefabricated stairs with a metal stair railing. Pinnacle Metal Products will provide you with the resources to make your designs a reality. Check out our project gallery if you need help coming up with a design or a modification on something that has been done in the past, to help inspire your vision. Contact us to request a quote for your custom design metal staircase or metal railing.